Put all salad ingredients (chicken, down to corn) in a large bowl. Set aside. Get a small mason jar or little Tupperware with a lid to mix dressing ingredients. Put all dressing ingredients in container. Shake it really good!!!! Pour on salad. ENJOY! 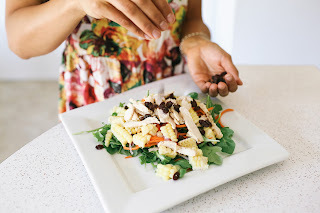 This salad is wonderful for lunch or dinner on the go! If you want to, enjoy with a slice of toast (in my case gluten-free) or throw it in a pita pocket for a tasty sandwich!